Here's a yearly subscription to my games! 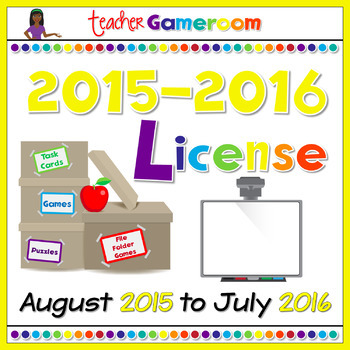 By purchasing this yearly subscription, you gain access to any new game I create for the 2015 - 2016 school year. Simply purchase, fill out your information, and you'll receive a folder containing any new games I plan to create this year (August 2015 - July 2016). This includes any holiday games I create for the current school year (example: Christmas Advent Event which guarantees at least 12 games). All for one simple price of $25. Want every powerpoint game I've created and will create? Purchase a Permanent License for $150. You can build towards a permanent license! Each year you can purchase a license to get all the powerpoint games I make that year. When you reach the price of a permanent license, you automatically will gain access to all the powerpoint games I'm created!